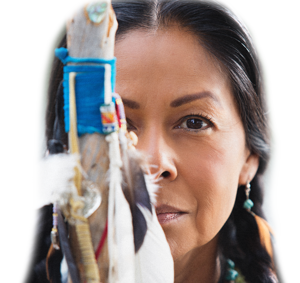 Gentle Thunder is a highly regarded Medicine Woman, Earth guardian, water protector, and humanitarian. Having been called to serve in many areas around the world, including South America, the World Peace movement in South Korea, the Parliament of World Religions in Salt Lake City and to construct medicine wheels as part of the planetary grid, Gentle Thunder also serves as a Sacred Water Carrier – it is her belief that uniting the water unites people, and uniting people will ultimately bring world peace. Gentle Thunder is well known for her Sound Journey’s, where her Native American drumming and powerful sound frequency toning takes attendees on a profound journey back in time, into the future, and then back to the present, experiencing a deep, self healing meditation to discover self love and a recalibration of cellular structure. With a special love of children, Gentle Thunder also created Heart Expression For Kids™ – a special event featuring toning, stories and other activities dedicated to providing young people a safe place to express themselves and to aid in the discovery of their own unique journey. Contact Gentle Thunder, share your story, or inquire about booking her services.